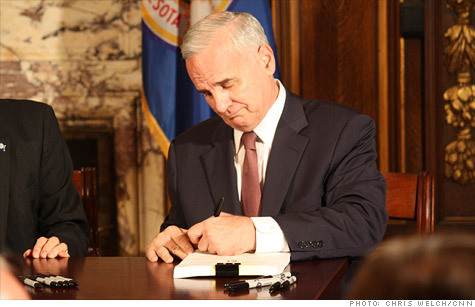 Minnesota Governor Mark Dayton ends his state's government shutdown with the stroke of his pen. NEW YORK (CNNMoney) -- The Minnesota shutdown is over. Governor Mark Dayton signed a $35.7 billion budget on Wednesday, ending the longest state shutdown in recent history. The signing came shortly after lawmakers approved a two-year spending plan in the wee hours of the morning. It ended a impasse that shuttered much of the state government since July 1. Nobody, however, was pleased with the budget. But Dayton, a Democrat, and Republican legislative leaders agreed to end the stalemate last Thursday so Minnesota could reopen. "While the budget agreement was not the most ideal to anyone, it was time to compromise, end the shutdown and put Minnesota back to work," said Senate Deputy Majority Leader Geoff Michel. The governor, who blamed the rival party for the shutdown after he signed the budget bills, said he wasn't happy with the spending plan either. "It's not what I wanted but it is the best option that is available and would be for any time," Dayton said. The budget cuts spending and does not raise taxes. But it relies on one-time accounting tricks -- including deferred payments to schools and additional borrowing -- to eliminate the state's $5 billion deficit. Each side touted what it won in the months of wrangling over the state's spending plan. The governor stressed that the budget protects services that many residents depend on and creates up to 14,000 jobs through a $500 million bonding bill for infrastructure projects. Dayton also pointed to Republican policy initiatives he blocked, including bans on stem cell research and abortion restrictions. Republicans, meanwhile, said the budget reins in government spending and does not raise taxes. It also reforms health care, welfare and education. These changes will put the state on "a more stable, sustainable fiscal path," Republican leaders said in a statement. Although Minnesota is now officially back in business, state agencies won't reopen immediately. Funding won't start flowing until Thursday, and employees won't be back at their desks until then, the governor said. It could take longer to restart state operations. Each agency has its own plan to get back online. Some parks could open as early as today, but others that suffered vandalism during the shutdown may remain closed for a few days. Construction projects could take even longer. "It's going to take a little bit of time," said Katharine Tinucci, the governor's press secretary. The shutdown brought many functions of state government to a halt. The state parks and rest stops were closed. Restaurants were unable to renew their liquor licenses. And some social service agencies did not receive their state funds. Roughly 22,000 state workers were laid off. But state services and agencies that were deemed essential by a state judge remained open during the shutdown. The state troopers continued to patrol, and state universities were open. The state funded custodial care for residents in prisons, treatment centers and nursing homes. And it continued to pay for health care for patients covered by state plans, such as Medicaid. The budget impasse finally came to an end last Thursday when the governor agreed to plug the remaining $1.4 billion budget gap by delaying state aid to schools and issuing bonds against future tobacco settlement payments. In turn, he demanded Republican lawmakers set aside various policy issues and drop their demand to cut 15% of the staff in all state agencies. -- CNN's Chris Welch contributed to this report from St. Paul, Minn.